Are you nervous about what products to use on your precious baby at bath time? Are you wondering how to keep their skin and hair clean, soft, and healthy? There’s nothing like the softness of a baby’s skin and the peach fuzz on their head, but because it is so new and sensitive it also needs extra-special care. If you’re wondering what the best products are to keep your baby clean without irritating their sensitive skin, read on. Use the links above to check the latest prices or read our in-depth baby bath product reviews below. Why Use Gentle Shampoos and Washes? How Frequently Should Baby Bathe? Separate Shampoo and Body Wash Products? When your baby is first born, you could probably spend hours running your hands over their soft skin, or inhaling their sweet, new-baby scent. However, their skin and scalp are much more susceptible to damage, drying, and the absorption of foreign substances. For this reason, it’s critical to choose gentle, specially-formulated products for cleansing rather than reaching for the ones you use on yourself in the shower. While the skin immediately acts as a barrier to outside irritants, the barrier properties continue to strengthen during the first year. This means your skin protects you a little better than your baby’s skin protects them. There is evidence a baby’s skin retains more moisture than adult skin. However, because of their thin skin, it also loses moisture more quickly, too. Bathing your baby with the wrong products can easily cause their skin to dry out if you’re not careful. Babies have less subcutaneous fat than adults, making it easier for toxins to be absorbed into your baby’s body. Your baby’s liver and kidneys are still young and immature. They don’t remove toxins introduced to the body as efficiently as yours, so it’s important to choose gentle, non-toxic products that won’t introduce harmful substances into your baby’s body. There are several things you should look for when choosing a suitable shampoo or body wash for your baby. Hypoallergenic: While there is no regulation of the term “hypoallergenic,” companies use it to indicate their product doesn’t contain some of the most common irritants and is not likely to cause a skin reaction. You should still read the ingredient list if you are concerned about certain substances, but a hypoallergenic label is a good first step in choosing a product that will be gentle on your baby’s skin. Fragrance-free: There’s nothing like that new-baby smell, so why would you want to cover it up with synthetic fragrances? Not only can added scents irritate your baby’s skin, but they can overwhelm your baby’s senses as well. If you feel strongly about choosing scented products for your baby, make sure the fragrance is from natural sources. Non-drying: Your baby’s skin releases moisture much more easily than yours, and many baby skin problems stem from being overly dry. Choose a gentle cleansing product that won’t dry out your baby’s skin. And if you’re tempted to skip the soap and use water? Don’t. Studies have shown that water-only cleansing dried out babies’ skin more than using a gentle cleanser. 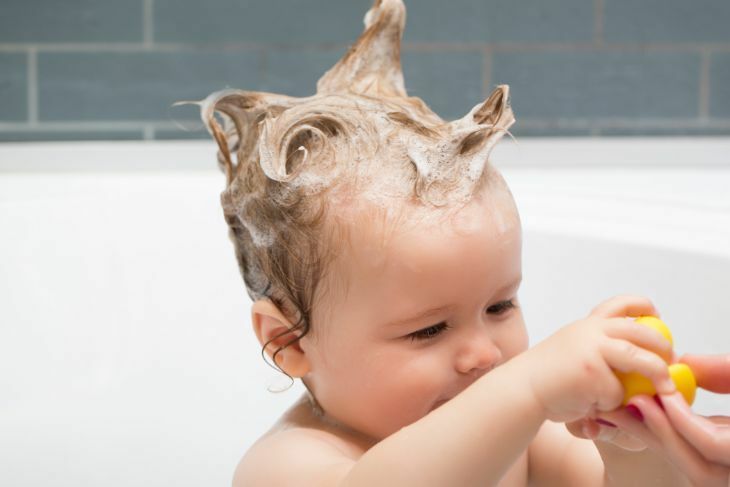 Much attention has been given to tear-free shampoos lately, scaring parents into skipping them because they supposedly contain numbing agents, which prevent babies from feeling a stinging sensation when the shampoo gets in their eyes. This rumor is false (source). Tear-free shampoos don’t irritate your baby’s eyes because they contain a much lower amount of the active cleansing agent than regular shampoos, making them much more mild and less irritating. So don’t avoid shampoos marketed as tear-free because you think they’re some sort of pharmaceutical sorcery. They’re perfectly safe for your little one. Here are ten bath products that are safe and soft on your baby’s skin. If your baby is struggling with dry hair and a dry scalp, you may want to consider reducing bathing frequency, and just wiping them down with a washcloth between baths. But when you do put them in the tub, choose a gentle cleanser that has a non-drying formula. And never use an adult’s dandruff shampoo on your baby’s scalp, as it has medical properties built into the formula. If you have serious concerns, speak with your doctor. This baby shampoo is specifically formulated with a pH level specific to baby’s skin so it will be gentle and non-drying. It is gentle enough to help with a host of baby skin conditions including eczema, acne, psoriasis, cradle cap, and excessive dryness. This product is organic and vegan, and includes no toxic ingredients so you can feel good about putting it on your baby’s skin. It is also free of parabens, which can act as a hormone disruptor. Several of the potential irritants commonly found in baby products are omitted in this gentle formula. It is free of gluten, soy, and dairy, along with oils from lavender, tea tree, and petroleum. It contains no sulfates or propylene glycol, which is an alcohol that can contribute to overdrying. It’s also tear free so it will not irritate your baby’s eyes. It is made with organic ingredients. It’s pH balanced for baby. It does not specify if it’s fragrance-free. It is more expensive than other products. Some parents found the plastic spout on the bottle snaps off easily. When you think about how easily your baby’s skin absorbs the ingredients in their soap, it’s no wonder you want to choose something that doesn’t contain harmful chemicals. Look for products that don’t contain synthetic additives, and if you do opt for a fragranced body wash make sure it’s from natural sources. It was developed by doctors out of 100 percent botanical ingredients and has been clinically tested for effectiveness and sensitivity. It contains moisturizers to help keep the skin from drying out and maintain its softness, and uses sea salt to purify the skin. It does contain a light scent, but it is derived from natural ingredients rather than synthetic ones. It is pH balanced to be appropriate for a baby’s skin, and doesn’t contain any of the common allergens or irritants including parabens, sulfates, animal byproducts, petroleum, perfumes, or dyes. It is certified vegan and cruelty-free and is manufactured in the U.S. It is also biodegradable so it’s environmentally friendly. You can choose to buy one bottle, or purchase two for a better value. It is 100 percent natural. It has won an award. It comes in a large volume if it doesn’t work for your baby. Some have found the pump doesn’t work well. It is not as thick as some other cleansers. Cradle cap is not dangerous or indicative of poor hygiene. It just happens, but you do need to be tenacious to get rid of it. Choose a gentle cleanser that won’t irritate the skin but will help moisturize the scaly spots on your baby’s scalp so they will be easier to loosen and wash off. You can feel safe using this cleansing gel to clean your baby, because the company’s formulation standards are more stringent than typical industry standards. It contains no parabens, phthalates, or other questionable ingredients. The formula has been rigorously tested to ensure it is safe for use on your baby and will not cause an adverse reaction. It contains a molecule extracted from avocado, which is an all-natural ingredient that helps to protect your baby’s thin skin barrier. It also helps to lock in moisture and prevent their skin from drying out. Vitamin B5 also contributes to effective cleansing without stripping the natural oils from your baby’s scalp and skin. Ninety percent of the ingredients found in this baby wash are considered natural. The formula does not contain soap, which can be drying. It is also tear-free, so it won’t sting if the suds get in your baby’s eyes. It is 90 percent natural. It will not dry out your baby’s skin. It is tested by dermatologists. Some parents found it to be drying. Some parents did not like the scent. If your baby has sensitive skin, you’ll want to choose a product that doesn’t contain any ingredients known to irritate skin or cause an allergic reaction. Look for the term hypoallergenic, but then dive deeper into the ingredient list to make sure you know exactly what will be touching your little one’s skin. The Cetaphil line was originally developed by a pharmacist and became trusted by dermatologists, pediatricians, and skin care experts for its gentle properties. Its baby line continues its commitment to high-quality, irritation-free skin care. 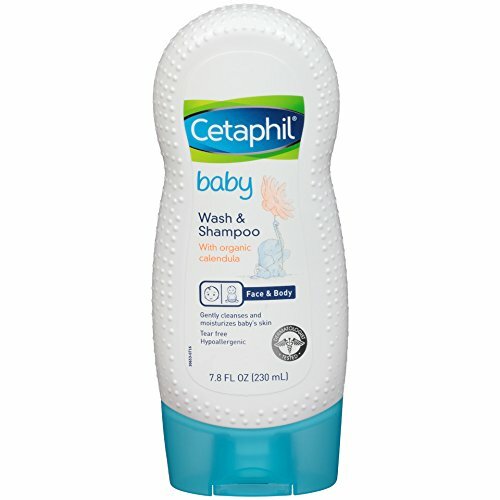 This baby shampoo and body wash has been tested by dermatologists and is considered hypoallergenic. It contains no parabens, which could mimic estrogen in your baby’s body, and also is free of mineral oils and synthetic dyes. Its tear-free formula won’t sting your baby’s eyes during bath time. It also forms into a rich lather, which isn’t always the case in tear-free products that have lower levels of surfactant cleansers. This body wash contains organic calendula, which is known to calm inflammation and soothe the skin. It also results in giving this product a light, natural, pleasing fragrance that is not known to cause reactions on sensitive skin. Some parents said water leaks into the bottle. It is not considered a natural product. Fragrances smell lovely, but the reality is that they can be irritants, too. Fragrance-free options help reduce your child’s likelihood of reacting the product. Plus, choosing fragrance-free bath products will allow your little one’s new-baby smell to shine through. 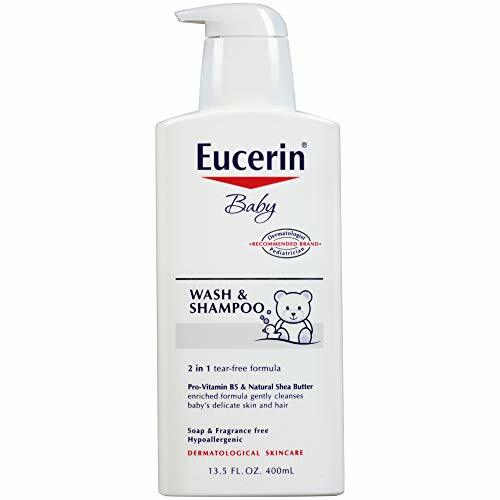 Shea butter is known for its ability to deliver moisture, and Eucerin includes it in their baby wash to help keep your little one’s skin and scalp from drying out during bath time. It also contains Vitamin B5, which can help soothe inflamed skin if your baby suffers from any irritating skin conditions. It does not contain soap or alcohols, which can prevent skin drying, and is also free of parabens, dyes, and fragrances. It is tear-free so it will not irritate your little one’s eyes and is even gentle enough for everyday use. Eucerin products are designed to protect, repair, and enhance the health of your baby’s skin. This baby wash has been tested by dermatologists and is widely recommended by pediatricians. You get a three-pack of this shampoo so it’s a good value. It does not contain drying agents. You get a large volume, so you’ve invested a lot if it doesn’t work for you. The ingredients are not natural and organic. Just like adult acne, baby acne is not caused by poor hygiene. It is a hormonal issue and will typically resolve on its own after a few months. It’s not uncomfortable for your baby, so just opt for a regular cleanser to keep the skin clean. Don’t scrub it so the pustules open, and never use medicated acne products developed for adults on your baby’s sensitive skin. This mild formula does not contain harsh cleansers, so it is gentle on your baby’s skin and will not cause irritation if it gets in their eyes. It lathers lightly and rinses easily so you don’t have to worry about it remaining on your baby’s skin and causing it to dry out. It contains chamomile and Panthenol, which help to soothe your baby’s skin if it’s irritated. This is particularly helpful for your baby with acne, as the inflamed skin will not be further irritated. It is also made without preservatives or fragrances, which could irritate sensitive skin. This product comes in a handy pump bottle, making it easy to use one-handed while you’re supporting your baby with the other. 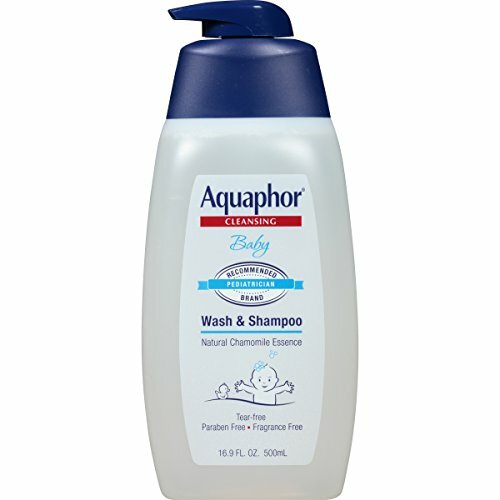 Pediatricians widely recommend Aquaphor as it is known to be gentle on your baby’s skin. It comes in a convenient pump bottle. Some parents said it smelled medicinal. Some said the pump did not last. Eczema can be super uncomfortable for your baby, and dryness exacerbates the condition even more. If your baby has eczema, make sure you choose a product that will not only calm and soothe their skin while you’re using it, but will also prevent the skin from drying out after they’re done with bath time. Aveeno is widely trusted to be gentle on skin. Many of their products are even approved by the National Eczema Association for use on eczema-prone skin. This baby wash is formulated with natural oat extract, which helps to calm irritated skin and also lock in moisture. Eczema can feel very itchy and uncomfortable for babies, so the oat extract can help to soothe their inflamed, painful skin. While the wash helps to cleanse the skin, it does not contain soap. This means it will not over-dry the skin, which can further exacerbate eczema. It is also tear-free so it won’t irritate their eyes, but it does contain a light fragrance which has the potential to irritate super-sensitive skin. 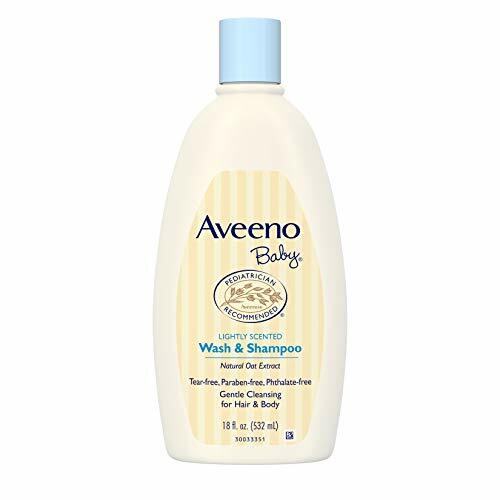 If your baby struggles with exceptionally severe eczema, you may want to use the tear-free shampoo for their hair and scalp, but then pair it with this Aveeno Baby Cleansing Therapy for the cleansing of their skin, as it has the National Eczema Association seal of approval. It contains oat extract to calm skin. It does not contain soap. Severe cases may need separate shampoo and body wash. Some customers found it doesn’t lather well. The term “organic” is heavily regulated, so choosing a product made with organic ingredients can help ensure your baby’s sensitive skin isn’t being exposed to harmful chemicals. However, be aware that organic is not necessarily synonymous with “natural,” which implies that its ingredients have gone through less processing. Many baby bath products don’t foam very well since they contain low levels of surfactants to make it gentler on your baby’s skin. However, the folks at Babyganics have figured out how to cleanse gently yet effectively and still preserve the lathering properties. It is extra gentle as it doesn’t contain common allergens or irritants. There are no parabens, sulfates, phthalates, petroleum, mineral oils, or synthetic dyes and fragrances. It is made with natural ingredients including a proprietary blend of five essential oils of tomato, sunflower, cranberry, black cumin, and red raspberry that deliver important antioxidants and promote the development of healthy skin. This product is never tested on animals and is made using organic ingredients. However, it’s important to note while many of the ingredients are certified organic, not 100 percent of them are. It comes in a convenient foaming pump that is easy to use one-handed. It has a thick foam. It is not made from 100 percent organic ingredients. Some parents said their baby developed a rash after use. It’s fun to give an adorable baby outfit to your friend who’s expecting, but sometimes the practical gifts are best because they’ll actually get used. Find a gift set that not only has the essential shampoo or body wash, but maybe a complete skincare set as well. 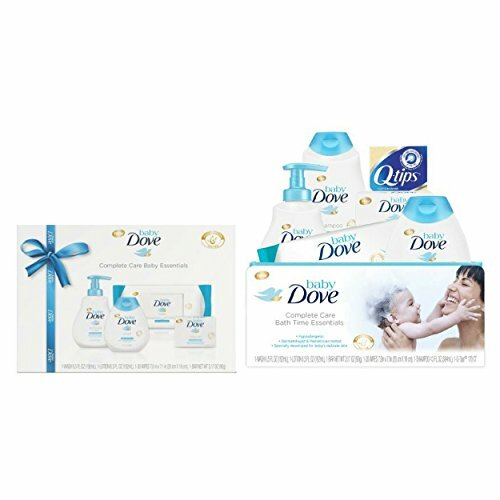 This gift set contains four different products for baby’s skin, including a Tip-to-Toe Wash, baby lotion, a baby cleansing bar, and baby wipes. This set of baby products from the Rich Moisture collection will help your favorite mama-to-be offer complete care to her baby’s skin. Dove has been pediatrician tested so you can feel safe using their products on your baby. And by trying these smaller-sized products, it gives you a chance to test out a new brand before committing to a full-sized product to see whether it works for you and your baby. The Tip-to-Toe wash is hypoallergenic and pH neutral, so it is safe for use on your baby’s sensitive skin even for daily use. It also is packed with nutrients to replace the nutrients and moisture lost in your baby’s skin during bath time. You get four trial products. It helps moisturize your baby’s skin. There is a light fragrance. You may not use all the products. If you’re planning travel, you don’t want to carry full-size products with you. And if you’re traveling by air with a carry-on, you’re limited to bottles 3.4 ounces or less. Not every brand sells travel-sized baby products; you might need to put your regular product into travel-friendly bottles or try a new brand for your trip. This travel kit contains products for the complete care of your baby’s skin and is completely TSA compliant, even coming in a handy transparent carrying case you can send through the scanner without worry. 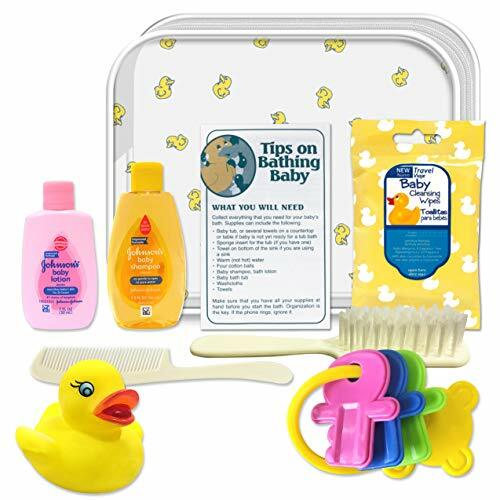 It contains baby shampoo, baby lotion, baby powder, and wipes along with a rubber duck, bath toy, and brush-and-comb set. Johnson & Johnson has been a trusted brand for decades, supplying the go-to products for your baby’s skincare. The shampoo itself has been tested by dermatologists and is tear-free, meaning it won’t irritate your baby’s eyes during bath time. It is soap free so it won’t cause excessive dryness of your little one’s skin, and the shampoo has been tested by dermatologists so you know it’s safe to use. It’s gentle on skin and scalp, and is considered hypoallergenic so it’s not likely to cause an adverse reaction on their sensitive skin. It comes in a carrying case. The products are smaller than necessary for TSA standards. The shampoo is not marketed as a dual-purpose body wash.
You may not use all the items. Some people swear by a bath as part of their baby’s nightly routine, but the truth is that experts do not recommend such frequent bathing. During your baby’s first month it’s recommended to simply wipe them down with a washcloth and gentle cleanser every few days. After that, you can begin bathing them in a tub, sink, or basin, but it’s recommended you do so no more frequently than three times per week (source). If your baby struggles with skin conditions that are exacerbated by dryness — such as eczema — you may even choose to bathe them less frequently, like once a week. Babies don’t get very dirty since they’re not moving around, so as long as you’re cleaning their diaper area regularly and wiping down areas where dirt can get trapped — like the folds of their neck — it’s not necessary to bathe them super frequently. Cradle cap: Cradle cap is marked by thick, scaly yellowish patches on your baby’s scalp that are difficult to remove. They are not painful or itchy, and are not caused by improper care on your part. Cradle cap is very common and may appear as a small patch or over the entire scalp (source). Eczema: Eczema looks like patches of severely dry, red skin that can appear anywhere on your baby’s body (source). It is itchy and painful, and may cause them serious discomfort. The causes are varied — for some babies, it’s genetic, for others it’s a reaction to something you put on their skin, and for others, it is affected by something in their or their mother’s diet. Baby acne and milia: Baby acne appears around 2 to 3 weeks of age and looks like small red bumps on your baby’s face (source). Up to 40 percent of babies get some form of baby acne. There is a similar condition, milia, which results in whiteheads (source). Neither condition is painful or dangerous, but they should be treated with extra-gentle care when washing to prevent the skin from opening, which could introduce bacteria and cause infection. 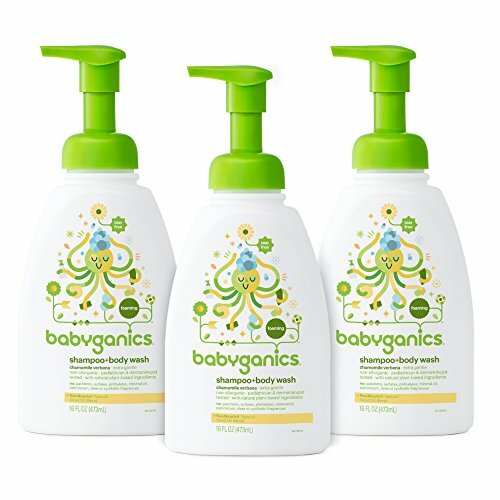 Babies need gentle cleansing that won’t irritate their skin and scalp. For this reason, there aren’t a lot of differences in the formulations for shampoo and body wash. Both deliver cleansing without over-drying. While some brands do market shampoo and body wash separately for babies, most are sold as a two-in-one item. After all, baby hair doesn’t need all the additives we adults need for extra volume, manageability, and conditioning, so it makes sense they don’t need much else besides a cleanser. 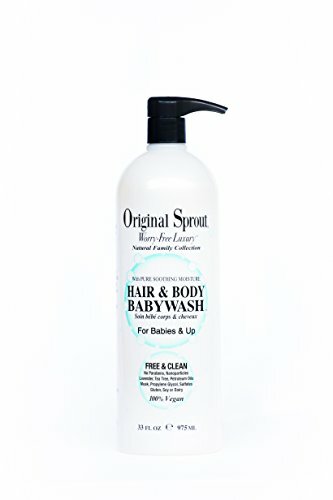 Our top pick is the Original Sprout Hair and Body Baby Wash. It is organic and vegan, and also formulated with clean, natural ingredients so it’s hypoallergenic and won’t irritate your baby’s sensitive skin. It also comes in a handy pump so it’s easy to operate one-handed, and is pH balanced to be used on your baby without drying out their skin. How often do you bathe your baby? Tell us in the comments below, and share with a mother who might be searching for the perfect shampoo and body wash for her little one. What’s the Best Non-Slip Bath Mat for My Baby? Do you know if the Mama Earth brand is good for your baby? I have never used this brand, so I, unfortunately, can’t give my opinion. Have any other mama’s used it who can offer some advice?